From routine visits to complex conditions, we specialize in women’s issues as their bodies change from the childbearing years through menopause and beyond. We have particular expertise in one of the many joyous events in a woman’s life—the birth of a child. Our knowledge, expertise and newest technologies can diagnose and manage any level of risk in a pregnancy. 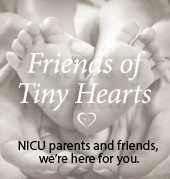 We know that some pregnancies come with complications so we’re here to help. We will make sure you’re comfortable and confident—before, during, and after your baby’s birth. 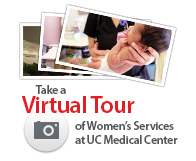 UC Medical Center houses the region’s first OB Emergency Care Center available to women 20+ weeks gestation and serves women up to 6 weeks post-delivery. Open 365 days a year, our board certified OB Hospitalists provide enhanced coverage and a critical safety net. We know that emergencies don’t always happen during office hours, and with many pregnancy complications faster treatment means a better outcome for the mother and baby. Our advanced specialty care, physician and nursing teams and collaboration across all specialties is why UC Health is a preferred provider. Click here to view your Baby Bearcat. Search to find a physician. To schedule an appointment please call 513-584-LADY (5239).